nemu*nemu: Kawaii from Hawaii | "I'm Not The Artist"
Scott (not the artist) and Audra (the artist and creator) surrounded by their creations at this year’s Fanime. Audra and Scott of nemu*nemu, an all ages web comic updated three times a week, hail from the lovely state of Hawaii. 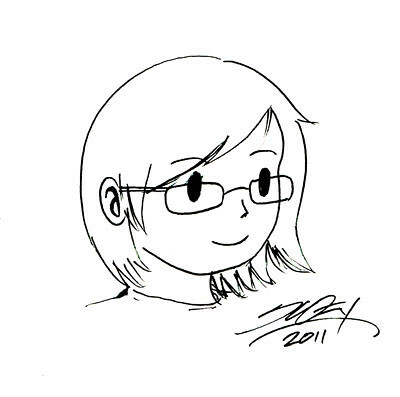 Their manga-style characters are created and drawn by Audra and while her husband of four years, Scott, maintains the website and provides backup support whenever necessary. It’s quite a production for these two to pack up their exhibit and travel to the mainland to promote nemu*nemu — a challenge they’ve taken on for the last five years. Which conventions do you attend? Audra goes solo to TCAF, APE and we’ve both attended Fanime, SDCC, NEWW2. Sketch of Audra by Scott. What’s your role in nemu*nemu? To what degree do you provide creative input? I try to help out with creative input when asked, but honestly, I live and breathe nemu*nemu so I’m always thinking about the comic and different stories, ideas for products, etc always come to me at the strangest times, so I write down the ideas and save them for later. Do you attend every convention with Audra? As much as I’d like to, it’s just not possible. I work a full time job and sometimes the mainland events are so close together that I’d be missing a whole lot of work by attending them all. It’s also quite costly for two people to go to every show. There has only been a couple of times that folks have confused me for the artist. Most of the time folks don’t even think that we’re the creators of the stuff they’re looking at in the booth. Often, folks are shocked that Audra is the artist and she’s in the booth selling her stuff. 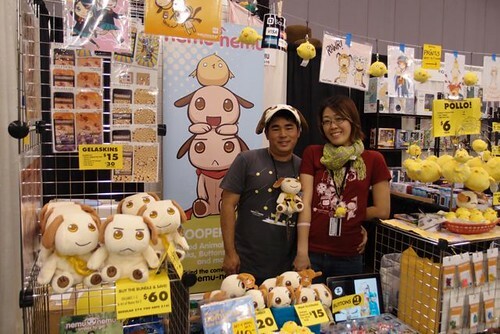 I guess a lot of folks think we’re just a vendor selling nemu*nemu branded goods. Are you both always manning the table and pitching the product? When there’s only two of us, we’re usually both manning the booth and pitching product. We’ll each take breaks to stretch our legs but it’s rarely just one of us in there. I’m usually the one that ventures out to get food and bring it back to the booth. Is it tough coordinating vacation days/time off to attend conventions? If I were to do every event, yes, it’d be really hard. Because I don’t do ’em all, it’s not so bad. They’re spaced out enough date wise and my work place is accommodating in letting me take time off when I need it. They all know my email address so it’s not like I’m not working when I’m on vacation. LOL! What’s the toughest part about touring the convention circuit? The expense is probably the hardest part. We struggle with airfare, hotels and freight charges to get our items to the event. Other than that, I usually look forward to our mainland events. How has working on nemu*nemu affected your relationship? I think it’s made it stronger in that there isn’t a moment where we don’t work together on this. It can be hard at times when we’re both focused so much on the business end, so we’ll take a day or two just to do other things beside the comic. For me personally, it’s been interesting and at times tough. When I get home from work, I don’t always want to work on something else. But I usually find that after a nice dinner and a shower, I’ll be up for working on something until it’s time for bed. Above all, when it’s your business, you can’t really get away from it. Like I said earlier, I live and breathe this comic. What do you do besides help out with nemu*nemu? I work full-time at a private school as an IT/Website manager. For hobbies, I enjoy catching up on the ton of comics I’ve bought but haven’t had a chance to read, playing guitar, building guitar effect pedals, photography, bike riding and— when I can— I sleep. What advice would you give other couples that are just starting out exhibiting together? Although every couple is different, I’d say: Don’t sweat the small stuff. An event lasts anywhere from 2-5 days, but your marriage is supposed to be forever. Always keep that in perspective. Enjoy your time together and make each event an adventure!